A forum thread [Google translation] posted to Chinese site WeiPhone.com earlier this month claims that Apple is planning to introduce its next iMac at a press conference either this month or next month, with the new iMac offering a redesigned body with a thinner profile. 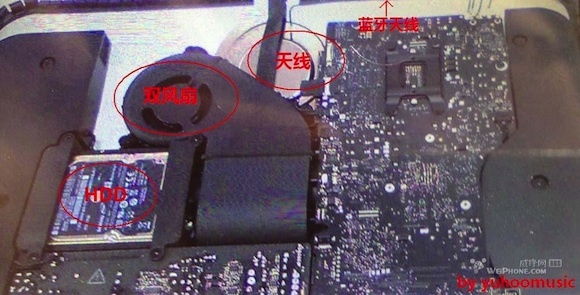 The report includes a photo of what is said to be the logic board and other internal components of the new iMac. The authenticity of the photo can not be confirmed, but iFixit's Kyle Wiens tells us that it does appear to be plausible based on some similarities to current iMac components. One example is the silver disc located behind the main layer of components. This disc has been found in Apple's iMac models over the past several years, and it houses the Wi-Fi antenna directly behind the Apple logo on the rear of the iMac's body. The Apple logo is the only plastic portion of the iMac's otherwise aluminum rear shell, thus providing the best location for optimizing signal reception. Other items of interest pointed out in the photo include the Bluetooth antenna (top edge), fans, and hard drive. The redesigned iMac is said to be considerably thinner than the current form factor, with the machine's thickness almost impossible to gauge when viewed from the side. The curved rear shell is also said to appear more like a water droplet than the squared-off design seen in the current model. The report also claims that the new iMac's screen is glued to the front glass of the machine, in line with previous rumors stating that Apple is moving to fully laminate the two components together for improved display quality. Also in line with previous rumors, the report suggests that Apple may first update the 21.5-inch model with the new design, which is said to maintain the existing "chin" below the display even as the body is tweaked with a thinner profile. The updated 27-inch model could then follow somewhat later, as has been suggested due to the challenges of laminating the larger display and glass with acceptable yields. The new iMacs are also said to be more expensive than the current models, but it is unclear how significant any pricing changes would be. Finally, the report claims that Apple is indeed working toward a release of a 13-inch Retina MacBook Pro. The notebook is said to already be in assembly in "Mexico and other places", with Chinese production coming later this month. The new 13-inch model is said to carry a code name of "D1", which fits with the "D2" code name that turned out to be the 15-inch Retina MacBook Pro. The report also seems to suggest that Apple will be tweaking the 15-inch model to address a few technical issues such as heat dissipation, but these changes will apparently be made behind the scenes and not be presented to consumers as an updated model. Apple is reportedly set to hold a media event on October 23 to introduce the iPad mini, but it has been unclear if the company plans to introduce its new Mac products at the same event. If Apple does decide that its updated Macs are significant enough to warrant a presentation for the media, it will likely show them at the iPad mini event rather than trying to squeeze in yet another separate event. If anything should "SHOUT" form over function, making a non mobile desktop computer (that is build for a serious fast task - computing) thinner just for aesthetic reasons, when it makes no difference to the products usefulness is just utterly idiotic. Are desks collapsing due to the current iMac weight? Can you get more iMacs on your desk if the shave another few mm off the thickness? You you sit side on and think, if only the iMac was a bit thinner? Do you have trouble positioning the iMac on your desk due to it's thickness? The iMac is "Supposed" to be the General Public's serious computer (not Mac Pro) it's supposed to be technically excellent. At the moment, due to Apples insistence on form over function it is limited to laptop chip sets as the case is too cramped and will overheat. Internal components run HOT, yes they are within tolerance, but still hotter than they need to run. And all heat does is shorten the lifespan of electronics. Some have suggested the constant yellow screen issues that have plagued the iMas for years is down to the heat/cramped conditions the screen has to sit within. It just seem crazy to make something, technically worse for visual sake, esp when on a desktop the thickness is a non issue. An iPhone and iPad and iPod all have to be limited technically in what they can do due to practical size and weight limitations, that is obvious. An iMac should not be deliberately burdened by those limitations. Do you really want iMacs always constricted to be not as good as they could be? Perhaps, who knows, even glued together to save that extra 0.5mm? A news article about an Apple Desktop Computer. But why the hell would they make them more expensive??? Hands down BEST news all week. I really do not understand Apples obsession with making everything as thin as possible. I wonder if they are trying to make the worlds first 2D computer that can only be seen by viewing it in the (x,y) plane. Does the iMac need to be any thinner? Seriously, I'd rather they didn't have to compromise on internals for the sake of a pointless keynote boast. Woohoo!!!! Even though I dont have the cash to buy a new one!!!!!!!! :D Thinner isnt always better and with something as large as an iMac i dont think its necessary. Apple should really concentrate on delivering a desktop GPU to its customers instead of the mobile chips it uses in its 'desktops' Now that the MacPro has been pretty much abandoned by Apple then maybe an iMac Pro will have a nice ring to it but only if it delivers on the power that a power using professional requires.